On the 11th of August 1494, German-born Flemish painter Hans Memling died in Bruges, the Netherlands, now Belgium. He was apparently first schooled in art in Cologne and then travelled to the Netherlands (c. 1455-60), where he supposedly trained in the workshop of the painter Rogier van der Weyden. He settled in Bruges in 1465, where he established a large shop and executed numerous altarpieces and portraits. 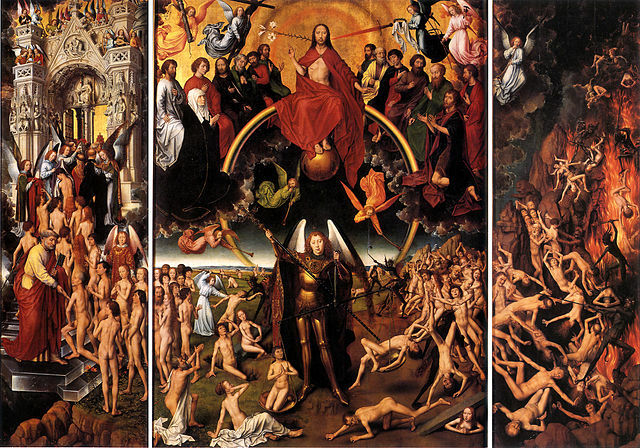 One of his most notable works is the triptych Last Judgement (1466-1473), now in possession of the Polish National Museum in Gdańsk. Allegedly the triptych was commissioned by Jacopo Tani, a Florentine merchant, and is an eloquent example of the exchanges between Italian collectors and Flemish artists common in the fifteenth century. “In Memling’s striking portrayal of Christ’s judgement at the Second Coming, Christ stands in the top center, flanked by his apostles on either side with those who are being judged below, all in vivid color and contrast. The New Testament tells us the significance of each participant in the final judgement. First and foremost are the supplicants who will be judged according to their works that are recorded in the “book of life” (Revelation 20:12). They will also be judged by their words (Matthew 12:36-37) and their thoughts (Romans 2:15-16). Christ’s role in the judgement is to stand as the ultimate arbiter (John 5:22) but his apostles also share a role in the judgement and “shall sit upon twelve thrones, judging the twelve tribes of Israel” (Matthew 19:28; cf. Luke 22:30).” (Derek Jensen, The Science of the Stars in Danzig from Rheticus to Hevelius). Frankly, I think the role of the rainbow is a bit overrated. It was a traditional element in Lochner’s Judgement, in Van der Wayden’s one, and Memling borrowed a lot of compositional ideas from their work. In the real world, a rainbow appears when there’s some sunlight. No light – no refraction. There’s no sun in the painting, just clouds over clouds. There won’t be any light, in fact, during the Apocalypse. So the rainbow’s nature has nothing to do with physics, it is a celestial rainbow. Physics/optical laws are not applicable to it, and Memling, I am sure, understood it very well.